We reported a little while ago about two things that are stirring up quite a ruckus in the digital world: The Android Market now has more free apps than its iOS counterpart, and that for the first time in a LONG time Android market share actually decreased slightly. As an Android user what does this mean for you? Anyone with half a brain knows that companies will play to their strong points. When the App Store had 10 times the amount of apps as The Market, Apple was quick to point it out (for proof, look at the press release of the iPad 2 and their comparison to Honeycomb). Now that Apple is losing ground (and quickly) in the number of apps, Apple likes to point out that people are happier with the quality of their apps (this, ironically coming before their announcement that they’re going to start “cleansing” the app store of “crappy” apps). While it’s no surprise that the App Store generally wins the award in the quality department, how much does that matter? Do you care if you get a slightly more polished game when you have to pay for it. Or does a slightly less perfect, free alternative suffice? A lot of iOS users were annoyed when they found out that Angry Birds was free on Android, but they had to pay .99 to get it for their iPhone (I can even recall a friend saying “why the heck can’t I have an app filled free version? They don’t bother me”). I think this is where the debate stems from, and where I think Android pulls away. Angry Birds looks just as good on my Evo as it does as my iTouch, and it actually plays slightly smoother on my Evo than it does on my iTouch. Some people may argue “well, not everyone can afford an Evo.” Well, people shouldn’t compare the iPhone to a cheap, $50 Android phone. That’s rather biased, don’t you think? When put up to the Android devices that compare with the iPhone, my experiences tell me that the games look just as good and play the same (and yes, games look better on a Super AMOLED screen than they do on a retina display). So if you take that out of the equation all you have let is options. You have the OPTION on Android to get an ad-free version for a price, or an ad filled version that’s free. Also, something a lot of people don’t realize, if you turn off mobile data and/or wifi you won’t get ads. So you can even get an ad free version without paying. Cool, huh? iOS developers know that a lot of buyers in that market will pay for their games so they don’t even offer an ad free version most of the time. 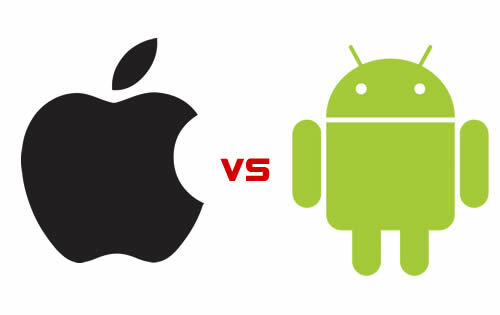 The fundamental debate: Android has options, Apple is more polished but with a “take it as we give it” mentality. I personally prefer the Android approach, how about you? The other thing that people are having a cow about is that Android market share went down for the first time in nearly 2 years. It fell from 53% to 50%. All I have to say is, are you kidding me???? Why is this a big deal? Yeah, Apple supporters will likely rejoice at the idea that Android has plateaued, but if you think that you aren’t looking at things past the numbers. Now is the first time we’re seeing Verizon’s iPhone have an impact on Android. Did it dent the market share? Absolutely. Did people assume it would do so? Absolutely. Does this mean Apple will catch up now and Android will slip? Absolutely not. Look, Apple went up 9% and Android went down 3%. EVEN IF all of those 3% users jumped ship to the iPhone it wouldn’t account for another 6%. More than likely that 6% (and possibly more) came from the RIM users jumping ship like they’re on the Titanic and the fact that there are a lot of people who held out on smart phones waiting for the iPhone on Verizon. The Army decided that it was going to use Android for it’s units. Android is becoming more and more business friendly. And there’s that whole Honeycomb Table market that hasn’t even begun (who really thought that the XOOM was going to be super successful at that price?). Android has not stopped growing. Trust me, this war has many battles yet to be fought. Previous articleWireless Tether no longer available for Android users?